For those without comedic tastes, the so-called experts at Wikipedia have an article about Sport stacking. Gnarly Connor! Stack 'em high! Cup Stacking is a fringe pseudo-sport championed by young white children all across the Midwestern United States (where real sports have been declared the Olympics of Satan and thus outlawed). 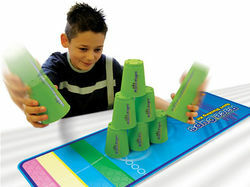 The game is also known as Sport Stacking, deemed as such by its creators in order to "immediately identify it as a legitimate competitive sport." To further this effort, the word 'Sport' was again used to describe Cup Stacking in 2005; unfortunately for enthusiasts, it was preceded by the words 'World's Dumbest' in this instance. Indeed, Cup Stacking is perhaps the most ridiculous activity ever to be entered into the realm of serious competition. Stacky! The Official Mascot of Competitive Sports Stacking!™ is too cool for school, baby! Cup Stacking was founded by welterweight ski champion Bode Miller as part of his week-long Drunk Olympics celebration. During a mandatory drinking binge sometime between drunken figure skating and the drunken long jump, Miller thought it would be funny to stack emptied beer cups on top of one another. In fact at the time, he thought it was the funniest thing he'd ever seen (or at least the funniest thing he could remember seeing). As his fellow competitors were equally inebriated, they too thought it to be rather entertaining. In fact, the sport became so popular with Team Belgium that their competitors began to stack compulsively (even during genuine sporting competitions). The ease-of-use paired with the sheer jovial nature of the activity made Cup Stacking a favored pastime among the drunken Olympians. A Cup Stacking drinking game was inevitably created, followed by a Stackers clothing line and Saturday morning cartoon. Young people, seeing their sports heroes stacking cups and laughing like hyenas, became naturally curious about the activity. Soon preteens all over the world were getting exceedingly sloshed and stacking cups like miniature psychopaths. Because underage drinking is socially accepted in most parts of the world, many children across the globe passed over Stacking in favor of just plain drinking. However, due to the uptight nature of American upbringing, the allure and mystique of a frantic game involving alcohol excited the hearts of kids across the nation. Seeing a lucrative business venture with virtually no overhead (besides the cost of plastic cups), the International Stackers Association of America (or ISAA) was founded, and the game was stripped of its alcoholic roots for marketability. Hickman would go on to host a SportsCenter segment entitled The World's Dumbest Sports, which would forever solidify Sport Stacking's place in the annals of half-assed sporting history. As Sport Stacking became more and more popular among the youngsters, hip and savvy corporate researchers couldn't help but take notice. In order to reach their target demographic, Sport Stacking became regularly referenced on Viacom networks, including MTV, VH1, and Nickelodeon. Over night, an entire generation rediscovered Cup Stacking. A resurgence in popularity followed for Stacky! 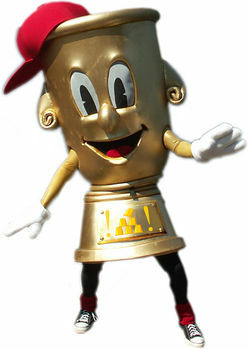 The Official Mascot of Competitive Sports Stacking!™, leading to a popular series of commercials for the Denny's restaurant chain. This reemergence would prove only temporary however, as the beginning of football season virtually eradicated interest in Cup Stacking for all except the midwest. As such, Stacking devotees stuck by their sport while the rest of the nation returned to actual contests of athleticism. Stack Cups! - Do this as fast as you can. The faster you stack, the faster you can put the cups away and forget about Sport Stacking. Flip Cups Around Some! - Make it look impressive; give people a reason to want to watch you stacking cups. Don't Drink Alcohol! - Because you are most likely a prepubescent girl, and this isn't France young lady. Team Spirit! - You are a winner, even if you don't stack the most cups! ..or stack cups the fastest! ..or enjoy yourself in the process! Lindsey "Stack Attack" Johannsen - 2004 Sport Stacking Relay Champion - A Minnesota native, Lindsey became interested in Sport Stacking in 2003 after quitting clarinet for the last time. Though Stacking commentators speculated that her age (10) would keep her from the gold, she went on to take 2004's world title at the US Stacking Open held in Lansing, Michigan. James "Crazy" Watson - 2005 Sport Stacking Gauntlet Champion - James got his nickname because he stacks cups so fast, it's crazy! Born in Mahopac, New York, James Watson is one of Sport Stacking's biggest celebrities. Earned his first Nike endorsement at age 7. Bested 20 other competitors for his Gauntlet Champion title in Aspen, Colorado. Carl "The Cable Man" Hungus - 2006-07 Sport Stacking Thunderdome Free-for-All - Carl Hungus was one of the sport's original competitors, starting his career with Bode Miller at the first Drunk Olympics. Hungus gained media exposure due to his brief banning from Cup Stacking due to his ardent refusal to participate sober. Went on to win the Thunderdome Free-for-All in Bartertown, earning him a special commendation from Aunty Entity. Janet "No Nickname" Wasserman - 2008 Sport Stacking Speed Racer - Janet stacks cups so fast, she's already won next year's competition. LUKE "Peeves" MYERS - 2007 A Minnesota native, Luke is the second fastest sports stacker in the world and has his very own youtube channel to inspire young sports stackers across the globe. He got 3rd place at the 2007 world sports stacking competion. He has appeared on a commercial for the incredible edible egg and Jared Myers and John Kerber directed a documentary following Luke's life called Stacks of Glory. ↑ Team Belgium's poor showing in nearly every event that year has often been attributed to their lust for Stacking. ↑ Let's Get Stackin' Starring Stacky! The Official Mascot of Competitive Sports Stacking!™, aired in 1984. ↑ Runners Up: Synchronized Swimming, Lawnmower Racing, Competitive Hugging, and Ironing. OUCH! Better Luck Next Time Kyle! This page was last edited on 2 November 2014, at 20:53.